MindFusion.Reporting for Silverlight lets you create stunning reports with images, header and footer and data from any .NET data source. Fast and easy. Each report consists of pages and report items. Each item has completely customizable location and size. You can add as many report items as you wish and choose their border and background. The number of report pages is unlimited. Each page can have a header and a footer designed through templates. MindFusion.Reporting for Silverlight supports all .NET data sources and you can use more than one data source in any given report. The report items can be bound to various properties of the supplied data using common Silverlight bindings. You can display list of elements - for example arrays or data tables. The component can work both in bound and unbound mode. 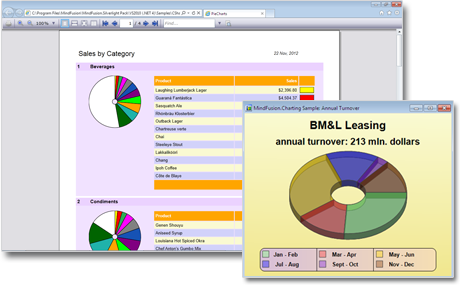 You can embed in your reports pie charts, which data is also bound to the data source. Each chart can have customizable colors, border and background. You can embed pictures or any Silverlight control and generate multi page reports. The layout of the report is also customizable - you can set the size of the target page and its margin. MindFusion.Reporting for Silverlight boasts a full featured report viewer that lets you change the page size of each report, the zoom factor and provides easy navigation between report pages. You can also render the reports on Silverlight canvas or print them. Another option is to export your report to Open Office XLSX files.